Intuitively, we all know that a play like this is incredibly rare. First, because these game situations don’t happen every game and second, because the play usually doesn’t work. But can we put some hard numbers around that obvious observation? Here’s an attempt to do so. I was unable to find on the internet anywhere any real work done on Hail Mary probabilities. Since there is no standard definition provided by earlier analyses, I’m going to set up the criteria as best I can to put the Mangum Miracle in its proper context. A Hail Mary is most commonly defined as a long pass into the end zone into the middle of a huge group of receivers and defenders. For the purposes of this blog, it’s going to have to be a little different. Play by play text doesn’t provide the details of where the ball was thrown and how many people were trying to catch it or bat it down or intercept it. Hail Mary passes can also occur in the 1st half or 2nd half and don’t always necessarily happen on the last play of the half or game. The offense has to be either tied or down by 8 points or less, so that a TD ensures a win or at least an opportunity to tie with a PAT/2pt Conversion. The statistics used in this analysis come from play-by-play data covering 7,220 games from the 2005 to 2013 seasons. Hail Mary – How Often? So most of the attempts (56%) come from a distance (60 to 99 yards) that is too far for most QBs to throw into the end zone. Mangum’s attempt from the Nebraska 42 is closer than 344 of the 403 (85%) attempts. In fact, the longest Hail Mary TD during this span was a 53 yarder by Arkansas State vs Memphis in 2006, so most of these 403 attempts were doomed to fail simply because they were too far away to work. Hail Mary – How Successful? Of the 403 Hail Mary situations from 2005 through 2013, only 10 (2.5%) resulted in TDs. Seven other receptions were stopped inside the 10 yard line. However as mentioned above, the majority of these attempts came from too far away to have any realistic chance of working, so here is a breakdown of success rates by distance. For passes like Tanner Mangum’s attempt from 40 to 49 yards away, only 3 of the 65 attempts (4.6%) resulted in a game-winning touchdown. From the 40 to 49 yard distance, more passes were intercepted (14) than were completed (10). Of the 297 attempts from 50+ yards away, only one resulted in a TD. It’s worth noting there was an attempt from 79 yards that was stopped at the 6 yard line and a 62 yard attempt which was stopped at the 1, but no other attempts outside the 50 came even close to the end zone. A Hail Mary pass was intercepted on 19% of all attempts, which is nearly 8 times more frequent than a Hail Mary touchdown. It is freely acknowledged this analysis is limited by the limited detail in the data available, but hopefully this post sheds at least some light on how unlikely an occurrence this win over Nebraska really was. Hill completed 28 of 36 of his passes. The 77.8% completion percentage ties his career best. He was 14 of 18 against Nevada in 2013. His 308 passing yards was his 3rd best passing total in a game, behind his 417 vs Houston and 339 vs Boise State. Taysom’s 177.14 pass efficiency was his career best as a starter. This is the 2nd start Hill had 3 TDs with 0 INTs. He also had 3 TDs and 0 INT against Boise State. Last year, BYU was atrocious passing on 3rd down and 7 or more yards to go. In 2013, they were 21 of 69 (30.4) for 329 yards, 0 TDs, 3 INTs and a pass efficiency of 61.8. They converted only 17 of those 69 attempts for a first down (24.6%). Against UConn, they were 6 for 6 for 45 yards and a pass efficiency of 163.0 and converted 3 of the 6 attempts for a first down (50.0%). With at least 21 yards against Texas, Hill will pass JJ DiLuigi for 12th in the BYU career rushing list. Hill’s 5.7 career rushing average is better than anyone else in the top 16 of the BYU career rushing leaders. Casey Tiumalu (17th) averaged 6.2 yards per carry. The UConn game marked the 4th game where Hill ran for at least 2 TDs. His career high of 3 was against Texas last year. In every game where Taysom Hill has thrown for 300+ yards, BYU has also rushed for over 200 yards. 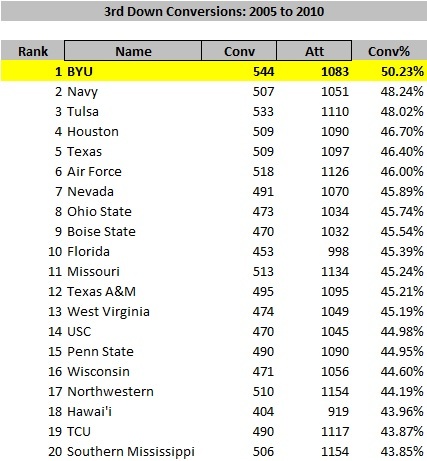 BYU’s average kickoff distance of 54.3 yards is the 5th worst in the nation thus far this season. The Cougars had the ball for 9:36 in the first quarter, but afterwards UConn won the time of possession 28:08 to 16:52. Bronson Kaufusi is 4th nationally with 2 sacks per game. BYU is 9th with 4 sacks per game. 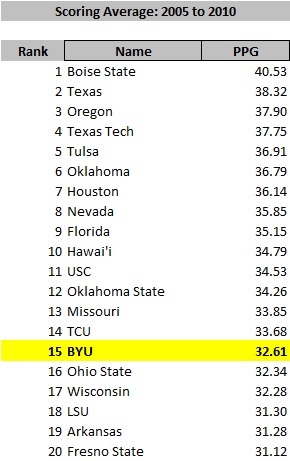 BYU’s 150 penalty yards is 31 yards more than any other team in the nation this year. BYU has had over 100 yards in penalties 15 times since 2001. Their record in those games is 10-5. It would seem that 513 yards of total offense would be really good, but it’s only good enough for 35th in the nation after week 1 (thanks largely to the numerous FBS vs FCS matchups this week). The Cougars’ defense only allowed a total of 10 points on 5 UConn red zone possessions. Due to unpopular demand, there will be no BYU vs Utah statistical extract post. Optometrists and Gastroenterologists everywhere rejoice! In the near future there will be a lengthier examination of Pass Efficiency and why it is absolutely vital that BYU improves significantly from their last place ranking in this category. 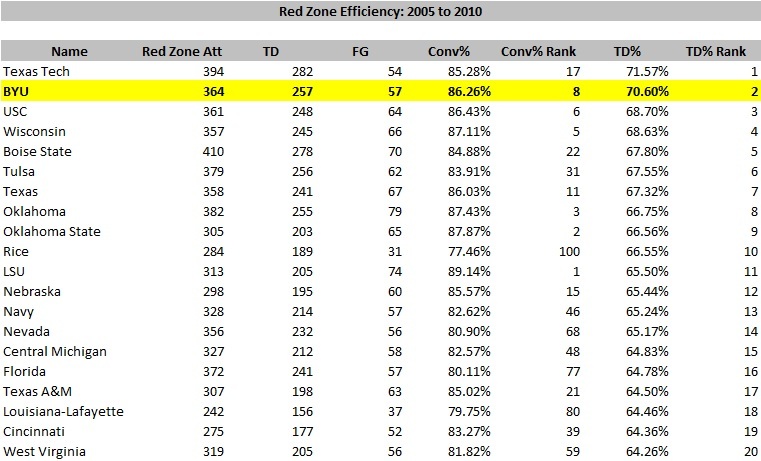 From 2005 to 2010, BYU absolutely dominated their opponents on 3rd down, converting over half of the time during that span. So dominant, they converted nearly a full 2% more than Navy, the next best team on 3rd down. EDIT: Just a quick note that the first chart shows all 3rd down conversions, including conversions through defensive penalties, but the second chart only includes first downs via pass and runs. It’s a limitation of the data available. So while Anae v2.0 may have some striking differences from v1.0, there’s still reason to believe that his offense will find ways to put points on the board by excelling in 3rd down situations, getting themselves into the Red Zone and turning those opportunities into six points.